Manchester's electronic post-rock outfit with the very silly name are back with their first album since 2007s Business Men and Ghosts, which saw them nominated for the American equivalent of The Mercury Music Prize, The Shortlist Prize, along with acts such as MIA, Wilco and Arcade Fire. And they've followed that double album with another. Jojo Burger Tempest is a 17 track album with an indulgently long title track which apparently deserves its own disc. The thought of a double album from a relatively obscure band doesn't fill me with enthusiasm but when I read that during the 18 months it took to record Jojo Burger Tempest the band wrote 2800 songs, I count my blessings that it isn't longer. My concerns are soon suppressed as I'm pulled into WFANFC's world of meandering, atmospheric and textured sounds. This is an album that twists and turns its way through musical genres, with shoegaze tracks such as 'Faster Daniel Faster' through to an unabashed pop song 'Silent Time', the Manchurian lads manage to touch on pretty much every genre of music that Manchester is famous for. Most of the tracks are atmospheric rather than melodic, there are very few riffs to get your teeth stuck into, and the ones that are there are usually masked with layers of loops and artificial noises but the album works as a whole; it's a dreamy and restless collection of progressive electro-pop. The 33-minute-long title track is an amalgamation of stuff that didn't make it onto the album. This track is a collage of sound, and manages to do just what the album does, which is take you on a whirlwind tour of musical genres, but in a much less hurried way. 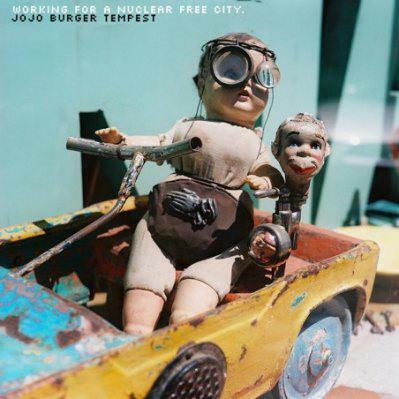 At times the album songs tried to squeeze too much into one song and 'Jojo Burger Tempest' benefits from having time to develop at a more natural pace. Where the album tracks seemed to switch drastically this epic track morphs quite happily from genre to genre. If you like an album packed with potential singles and catchy lyrics then this wont be for you. This album is more of a soundscape that takes you on a journey where musical genres are the sights and there's no real destination and, while the lack of focus may not be everyone's cup of tea, WFANFC make up for it with eclectic experimentation. Just listening to this now and loving it. For those in Manchester looking for their city's next big thing, stop ignoring this lot. 'Hurts' my arse (no pun intended). Didn't know they had a new one out! I need to listen to this.